There really isn’t a bad way to eat brownies – brownie bites, brownie cookies, brownie sundaes, brownie crisps etc etc. One of my deep dark secrets is that I even make boxed brownies on occasion – sometimes you just need a fix and they don’t have to be made with high end Valrhona chocolate to be good. This recipe is terrific because it serves a crowd but looks a bit more high end then just cutting regular bar brownies and putting them on a plate (though admittedly it’s still not the prettiest dessert as the photos can attest – trust me you wont care when you are eating it). If you like to lick the beaters then you are going to love this recipe – the edges get crunchy and baked and the middle stays nice and gooey so it’s practically warmed batter. I also love that the ingredients are all pretty basic – if you have a decent baker’s pantry then you probably have them all on hand. You can make it ahead but I would do it day of, any longer than that you will lose the distinction between the crunchy and gooey bits. This is the ultimate comfort food and right now I need a little comfort as two of the people who supported me most in this endeavor are moving on to bigger and better things in Denver. Dave and Ashley (and little Eliza) are terrific friends who are always willing to try my menu experiments, pushed me to create this blog, see boundless opportunities around every turn and are fearful of nothing. They have been an incredible inspiration to me and many others and while D.C. will be sad to lose them I am super excited to see what Colorado holds in store. Heck it might even inspire a cooking at high altitude post! So all the best to them and now I can drown my sorrows in this lovely brownie goodness. Preheat the oven to 325 degrees. Spray a 2-quart (9 by 12 by 2-inch) oval or rectangle baking dish with cooking spray and set aside. Cut up the two sticks of butter, place in a microwave safe bowl and melt it in bursts of 20-30 seconds until melted. Let cool. 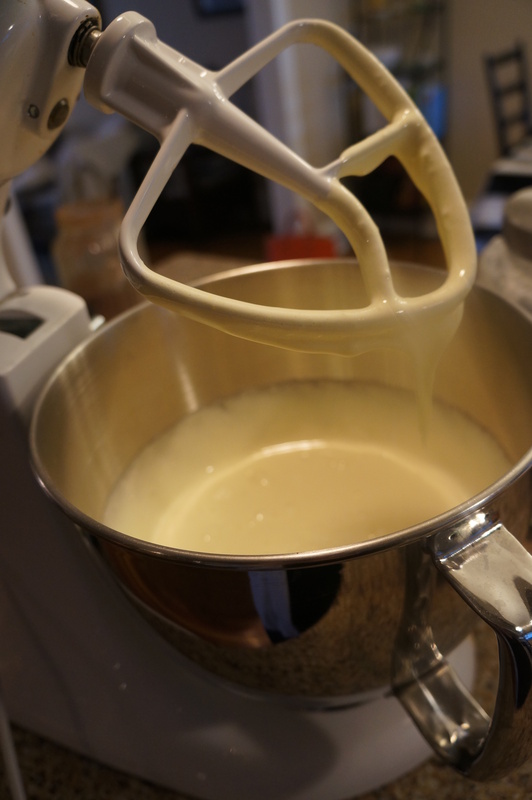 In a stand mixer using the paddle attachment (or you can always use a regular hand mixer in a large bowl) beat the eggs and sugar on medium-high speed for 8 minutes. 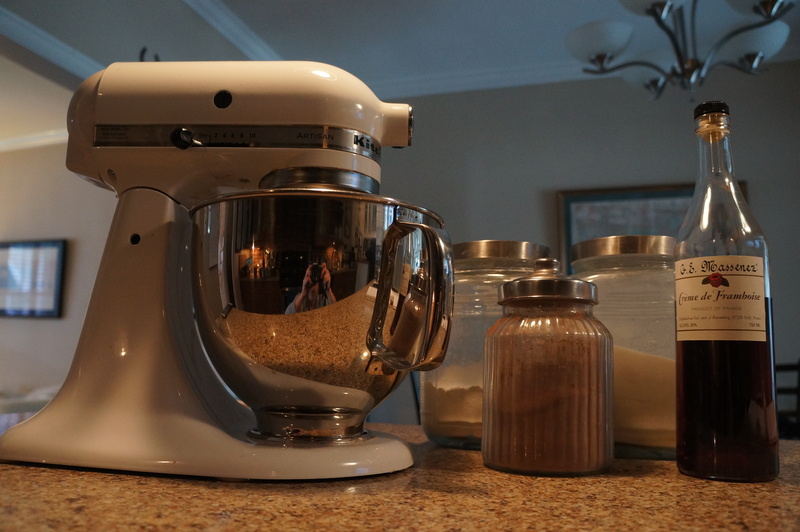 This is why a stand mixer can be really helpful – 8 minutes is a long time to hold a mixer! However, this is a necessary step, you want the eggs to be very light, almost white and thick. 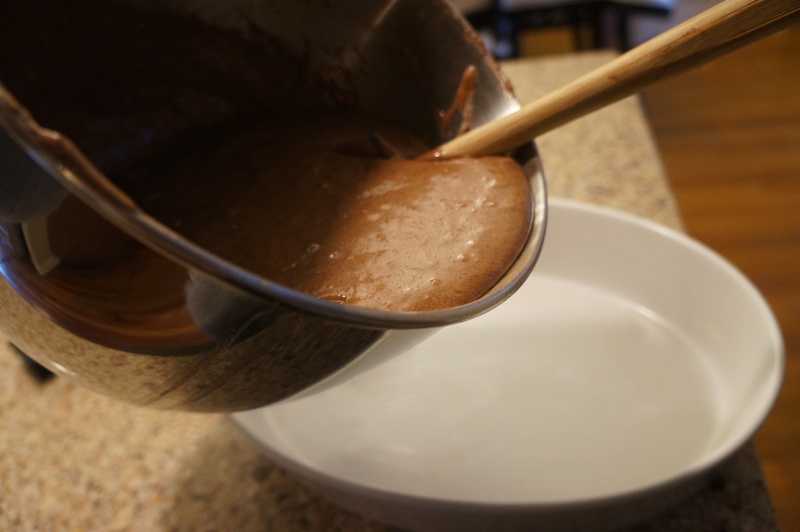 In a smaller bowl mix the cocoa and flour with a whisk and set aside. With the mixer on low add the vanilla extract and framboise (or coffee). Ina suggests the framboise and it really is quite good – you don’t necessarily taste any raspberry flavor but it adds depth. Understanding that most people don’t have that on hand some cold coffee would be good and bring the same complexity. Then add the cocoa powder and flour. Be careful not to over mix here, just blend until incorporated. Add the butter and mix until everything is combined. 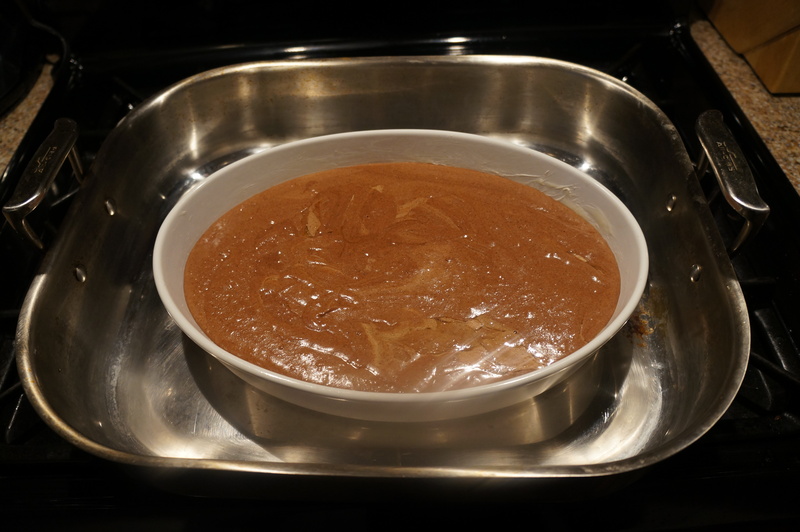 Pour the batter into the dish and then place it in a large roasting pan. I use my turkey roasting pan – basically you need something large enough to accommodate your baking dish along with several inches of water (i.e. a baking sheet won’t work). Use hot water from a tea kettle or the tap and then carefully pour water into the roasting pan so that the water level comes up about halfway up the side of the baking dish. 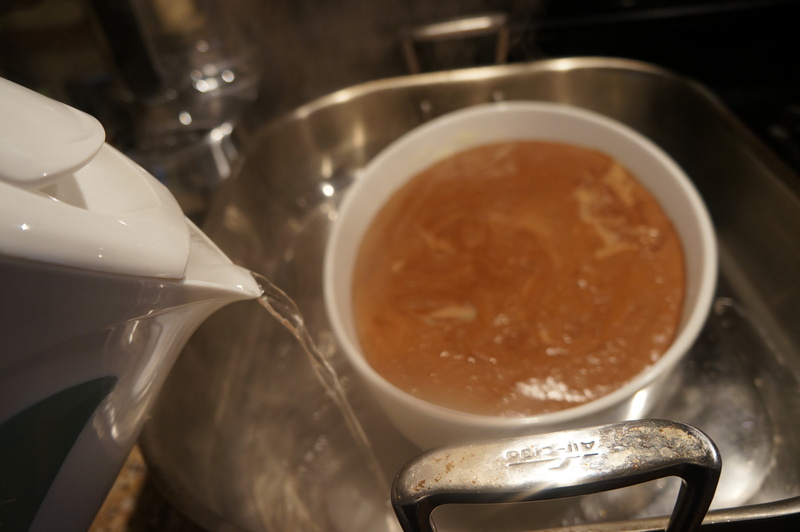 This is called a water bath and something you may be familiar with if you have ever cooked flan or creme brulee. The water helps keep the heat even without baking the brownie mix all the way through and the water helps create steam in the oven which keeps whatever you are cooking from drying out. Try not to spill any water in the actual brownie batter but if you don’t it’s not a huge deal. Bake for an hour. You can test for doneness with a toothpick but it’s not really necessary/helpful because it won’t come out clean – it’s not really a cake, or a pudding or a soufflé either – it’s a half-baked yummy brownie goodness. Don’t worry if it cracks or craters – its supposed to do that and is part of the charm. Let it cool a bit (or serve it room temperature) and serve with ice cream. Preheat the oven to 325 degrees. Spray a 2-quart (9 by 12 by 2-inch) oval or rectangle baking dish with cooking spray and set aside. Cut up the two sticks of butter, place in a microwave safe bowl and melt it in bursts of 20-30 seconds until melted. Let cool. In a stand mixer using the paddle attachment (or you can always use a regular hand mixer in a large bowl) beat the eggs and sugar on medium-high speed for 8 minutes. You want the eggs to be very light, almost white and thick. 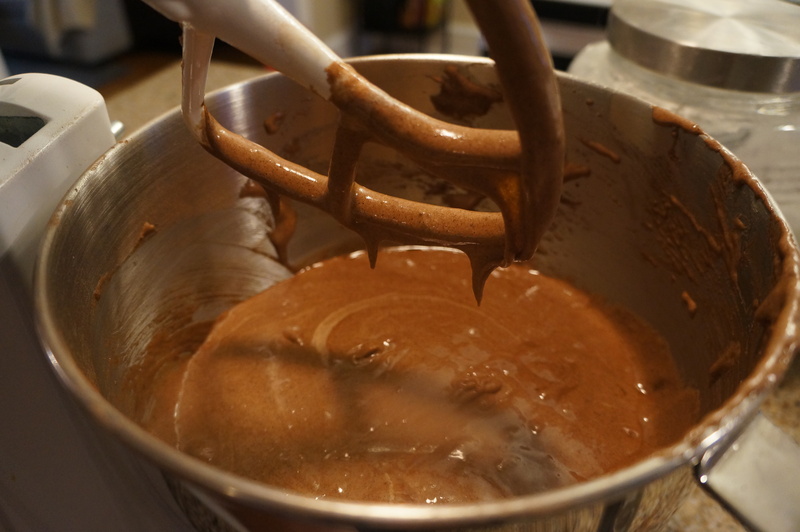 In a smaller bowl mix the cocoa and flour with a whisk and set aside. With the mixer on low add the vanilla extract and framboise (or coffee). Then add the cocoa powder and flour. Be careful not to over mix here, just blend until incorporated. Add the butter and mix until everything is combined. Pour the batter into the dish and then place it in a large roasting pan. Use hot water from a tea kettle or the tap and then carefully pour water into the roasting pan so that the water level comes up about halfway up the side of the baking dish. Bake for an hour. 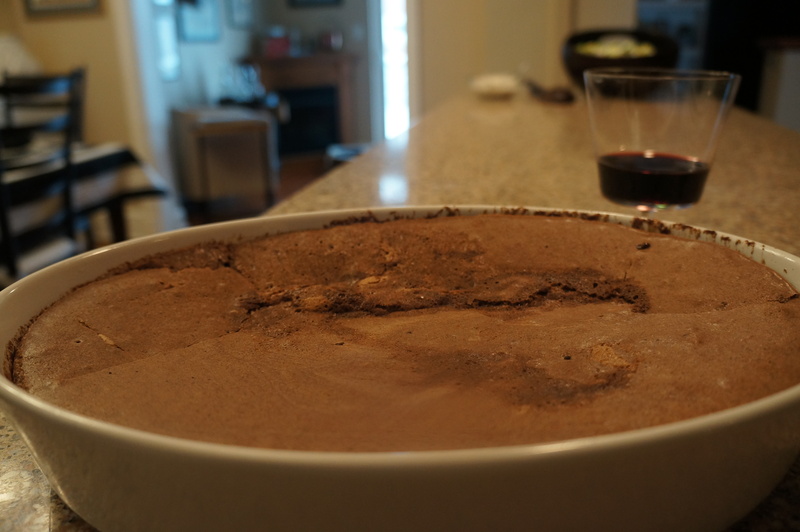 Let it cool a bit (or serve it room temperature) and serve with ice cream. OMG!!!! TEAR JERKER post for sure!!!!!!!!!!! So sad to leave you guys and especially these brownies, which are probably my most favorite dessert you ever made for us!!!!!!! I will shamelessly use this and anything else you crave to lure you back to DC for visits! !